Ocean Technology Systems is the Leader in State-of-the-Art Underwater Communication Systems servicing the Sport, Commercial, Movie Industry, Search & Rescue and Military communities around the world! Looking for the finest underwater communications systems available? You have come to the right place. OTS offers hard-wire, through-water, sonic, wireless, diver recall systems, Buddy Phone, Aquacom, Hot Mic, and Buddy Line products. They also offer support items such as earphones, microphones, full face masks, and ComRope. Scuba Center is an authorized OTS Dealer. PDF data sheet AMP-4M, 4 pin male: The AMP-4M (p/n 900030-000) has 4 sockets and uses a gripper ring to secure it. The connector is not designed to be connected or disconnected underwater. This connector is pictured with the small cover. Note: This connector has sockets but is considered a MALE connector. PDF data sheet Banana plugs (Red & Black): The BNP-1 (black, p/n J051) and BNP-2 (red, p/n J050) double banana plugs are most commonly used on umbilicals for either 2- or 4-wire hard wire communications. The picture to the left shows how you can stack them. PDF data sheet Hi-Use -- The OTS-4P (p/n 900270-000) Hi-Use® connector is used on many products. The most common are OTS EMA-2 and ComRopes. The OTS-4P has 2 pins and 2 sockets. A potting sleeve is included with the product. The OTS-4P can be connected underwater. (Note: this is an OTS manufactured connector). PDF data sheet Marsh Marine Female 4 pin connector: Mates to the 4 Pin Marsh Marine Male Waterproof (W.P.) connector as often used on Kirby Morgan EX0-26BR full face masks and others. Allows for four wire/ round robin communications when diver to diver communication is desired. OTS CR-4 ComRope is 100% Nylon, 7/16" (10mm) static kernmantle rope designed with four specially configured wires down the center. Breaking Strength of Wire in Rope: 450 lbs. wire in rope will break. Breaking Strength of Rope with Wire: 2,900 lbs. (average) rope will break. Wires: 4 wires. Shielded cable for microphone wires. Size: 7/16" (10mm) with wire. OTS ComRope is shipped assembled complete with connectors that suit your needs on either end. As they are built to order, please allow a few weeks lead time. 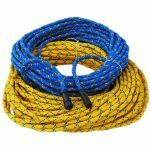 Due to weight, a $25.00 shipping charge per rope will be added to each ComRope order during final processing. Introducing, the first of it's kind! OTS Floating Communications Cables were made with Public Safety and Aquarium divers in mind. This buoyant cable helps minimize entanglements hazards by keeping the bulk of the cable on the surface. The floating cable also reduces the amount of "drag" felt by the diver below and can be used as a safety line with a breaking strength of 2,592 lbs. OTS Floating Comm Cable is High Strength Twaran Aramid Fiber Braid / Foamed Thermoplastic Polyurethane Jacket. Available in two colors: blue and yellow. Breaking Strength of Rope with Wire: 2,592 lbs. (average) rope will break. 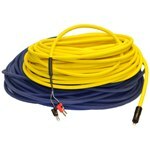 OTS Floating Comm Cable is shipped assembled complete with connectors that suit your needs on either end. As they are built to order, please allow a few weeks lead time. ComRope Bag: ComRope Bag is manufactured from a heavy duty, high visibility mesh that features a reinforced mouth with an adjustable draw-string Nylon cord. A convenient opening on the side of the bag allows you to access the topside connection of the ComRope. The ComRope Bag is the perfect accessory for tenders who require portability. Holds up to 200' of OTS CR-4 ComRope. Searchline Float: Designed to keep searchlines above under water obstacles to avoid entanglement. Buoyancy 3 lbs. 8 oz. It is extremely important that the divers are dressed out in a manner that will strain-relieve the ComRope. Commercial dive schools typically instruct students to have the ComRope tethered to the diver’s harness or buoyancy compensator with a quick release. If someone pulls on the ComRope and the diver loses control of the ComRope, the pull is on the harness, not on the diver’s mask. This setup prevents accidental removal of the diver’s mask. Strain-relieve the ComRope in two places on the diver’s end. The first point should have some sort of “D-ring” heavily taped or tied about 4 feet from the Hi-Use® connector (# 24). This “D-ring” will be clipped onto the diver’s harness or buoyancy compensator via a carabiner or some good quality quick-disconnector. This connection will help prevent the ComRope from pulling on the diver’s full-face mask. If the diver is set up properly, the tender’s pulling on the ComRope should pull on the diver’s hand loop first. If the diver is not holding the hand loop, the strain should go to the belt “D-ring,” not the diver’s full-face mask or diver’s earphone-microphone assembly (# 22 & 23). The diver should tie the ComRope, making a hand loop about 6 inches in diameter about 10 feet from the Hi-Use® connector. The diver will now be secured to his harness or buoyancy compensator and have a hand-hold he should hold during the dive. The diver should have control of the ComRope throughout the dive. He should feel what is going on, giving topside directions when slack needs to be taken up or when more rope needs to be paid out. If the diver lets go of the hand-hold, the carabiner–D-ring combination will absorb the tension. In the event the diver must break lose of the ComRope totally (i.e., in an emergency), the diver should let go of the ComRope hand-hold and unsnap the device holding the D-ring. The diver then should let topside know what is going on before he detaches the Hi-Use® connectors. The diver then should proceed directly to the surface and reestablish communications. The tender should ensure the ComRope on his end is also strain-relieved in some manner. This will prevent the diver or topside tender from pulling on the connections made on the electronics module. Do not store the ComRope in a sealed container without drying it first. It will grow mold if not dry. If the ComRope was used in salt water, soak it in freshwater for about five minutes before drying. Periodically check the connectors to ensure they are clean and lightly lubricated with a high-grade silicone grease. If the diver plans to make a jump, it is extremely important the tender does not forget to pull slack in the ComRope. The ComRope should barely touch the water while still being attached to the diver. This gives the diver the amount of rope necessary to hit the water with some slack. If there is no slack in the rope, the diver could be seriously hurt by being hung or jarred.